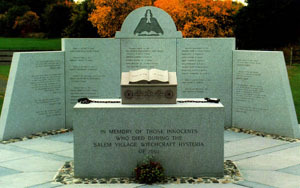 On May 9, 1992, the Salem Village Witchcraft Victims' Memorial of Danvers was dedicated before an audience of over 3,000 people. It was the first such Memorial to honor all of the 1692 witchcraft victims, and is located across the street from the site of the original Salem Village Meeting House where many of the witch examinations took place. The Memorial serves as a reminder that each generation must confront intolerance and "witch hunts" with integrity, clear vision and courage. This memorial project was undertaken by the Salem Village Witchcraft Tercentennial Committee of the Town of Danvers which commemorated the 300th anniversary of the witch prosecutions during 1989-1993. The Memorial itself was designed by Committee members Richard B. Trask; Robert D. Farley, CSI; and Marjorie C. Wetzel. Finance Chairman Ralph E. Aridff, Jr. raised money for the project through donations of numerous town, civic, patriotic, business and ethnic organizations and by individuals. The property was donated and is now maintained by the Town of Danvers, and the Memorial is open to the public daily from dawn to dusk. The design of the Memorial is highly symbolic in nature. On a light colored Barre granite sarcophagus measuring 4' x 8' x 4' rests an oversized representation of a slant-top bible box. In colonial times such boxes were used as storage containers for precious volumes and papers. The positioning of the block with the bible box on top is reminiscent of a colonial pulpit and its juxtaposition and correct alignment with what would have been the original Meeting House pulpit across the street is purposeful. Yet the bible box, a domestic item of furniture, better represents individual home-inspired devotion, rather than communal, ecclesiastical worship, denoting the significance of personal beliefs and morals. 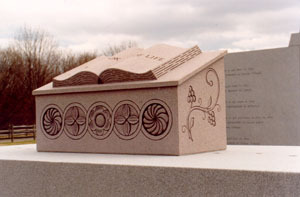 The box is composed of Canadian Pink granite, and on its front is carved several different and local style rosettes, typical design features found in both Puritan furniture and gravestones. The five rosettes banded together by a serpentine vine are Puritan symbols for eternity. Resting on top of the bible box, and composed of the same brown-reddish granite as the box itself, is an open book with an inscription in 17th century typeface reading, "THE BOOK OF LIFE." In biblical language this phrase represented the record of those who should inherit eternal life. During the witch trials numerous persons testified that the accused had signed the "Devil's book" thus becoming witches and doing the work of the devil. Those who were executed for witchcraft refused to confess to being witches, for they wanted to be inscribed in "The Book of Life." At the time almost all in the Puritan community believed the accused to be guilty, while today the historical record, a modern-day "book of life" of sorts, has rectified the former deadly falsehoods of 1692. The weight of truth, symbolized in the granite box and book, is also represented smashing through the falsehood of history, depicted by a pair of large scale reproduction metal shackles divided in two by the book and resting broken upon the block of granite. Curtis M. White, a talented blacksmith, staff member of the Saugus Ironworks National Park and at the time the resident overseer of the Rebecca Nurse Homestead, hand-forged the chains. Carved on the face of the block granite is the inscription "In memory of those innocents who died during the Salem Village witchcraft hysteria of 1692." To the rear of this granite piece stands a three-panel 12 feet long by 8 feet high granite memorial wall containing in 17th century spelling form the names of the 24 men and women and one child who died as a result of the witch hysteria. Also included are the towns of origin of these people which include besides Salem Village, Salem Farmes (Peabody), Salem, Andover, Billerica, Amesbury, Reading, Topsfield, Marblehead and Rowley. Above the center panel on a granite ellipse is carved the Tercentennial Committees logo featuring a man grasping an open book. The man's hair style, robe and neck bands are reminiscent and symbolic of a 17th century cleric with an open bible or a magistrate with an open law book trying to come to understand and interpret the witch hysteria which had overtaken much of Massachusetts. The logo was designed for use of the Tercentennial Committee and donated by Jim Barina, founder of 'Spellbound,' a Salem, Massachusetts, advertising agency. On each side of the Memorial wall stands at a 45 degree angle to it a wall inscribed to include in their own words brave statements made by eight of the accused witches during their harrowing examination just across the street from the memorial location. Note: The spelling of 17th century names varied widely even within families. Though there were several choices for spellings of many last names, the ones represented here are those for which the best contemporary evidence exists.